Flagstone patios are a beautiful option for any patio home addition. Our designers and contractors are experienced and will work with you every step of the way to make sure your designs are being carried through correctly. Aside from aesthetics, flagstone is an ideal choice for laying patio for several reasons. The narrowly packed joints of flagstone allow water to permeate the surface as opposed to simply running off. The colorful appeal of flagstone creates an earthy atmosphere and organic tone for your patio. Since flagstone is a sedimentary rock, it’s made of many layers. This quality makes flagstone a strong and stable solution for your patio needs. One of the benefits of working directly with flagstone is the variety of natural tones in red, gray, blue, and brown. Due to the many options available with these products, your patio can be customized precisely for your needs in numerous flagstone patio designs. Flagstone patio installation is simple. For a permeable patio, the product can be laid dry. Vibrant flagstone patio designs can even include moss or grass between each stone. For those preferring a formal patio, flagstones will be selected individually and will be placed in a repeating pattern. The formal setting is ideal for the patio user planning to add sliding chairs surrounding a table. 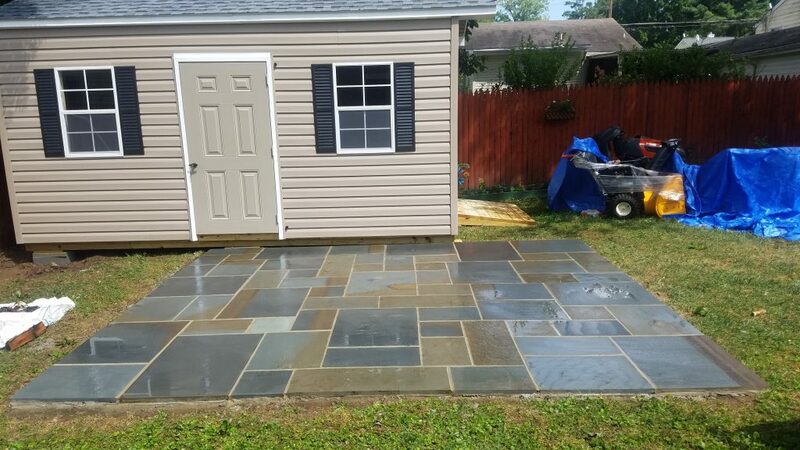 For a more casual and unique look, add random flagstones throughout the patio. If you’re imagining wide and wooden furniture on the scene, the random stone design is the perfect choice. 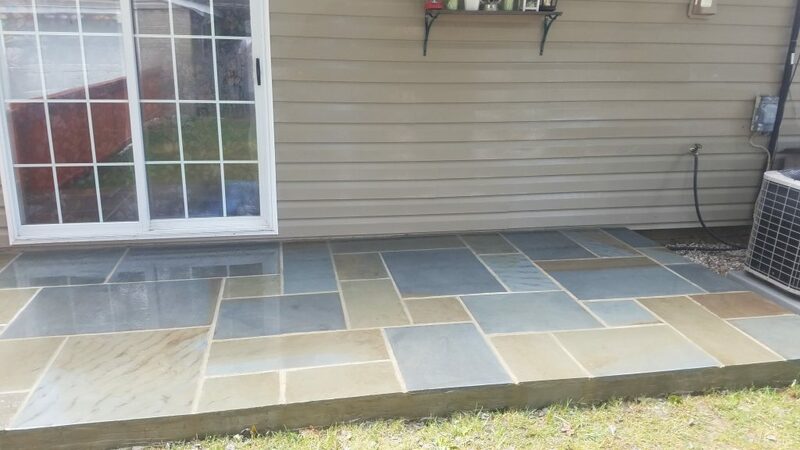 Flagstone’s slip-resistant surface and long-lasting durability are an ideal choice for all individuals and families that want to purchase a reliable and enduring product. Due to the stone’s sedimentary nature, flagstone patios must be protected from natural elements like UV rays and water. A sealant applied to the finished patio will lock in the color and quality of flagstone for the long run. The stone itself is a valuable product, so an important aspect to consider for your new patio. The total cost will depend on your area and the size of your patio. Flagstone can also be mixed with other types of stone for a more varied final design. Regardless of your needs, our team will work with you to generate the patio of your dreams. The durable result, whether elegant or casual, will appeal to your family and your guests for years to come. 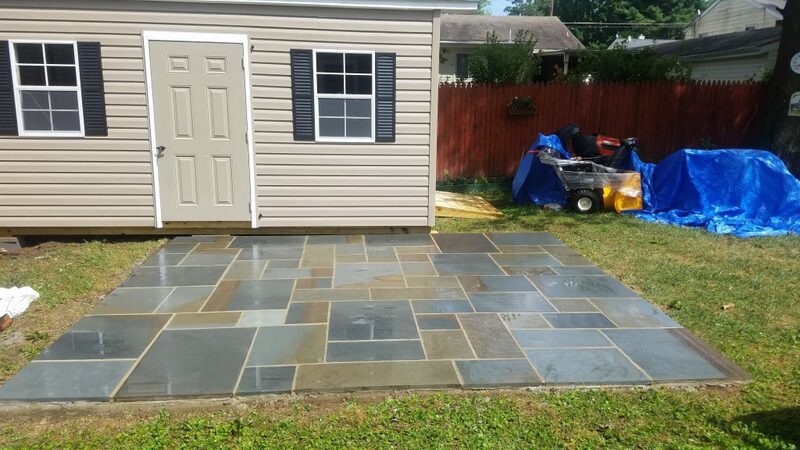 At Northern VA Patios & Construction, we provide experienced masons for installation in combination with some of Northern Virginia’s top exterior designers to bring your vision to life. 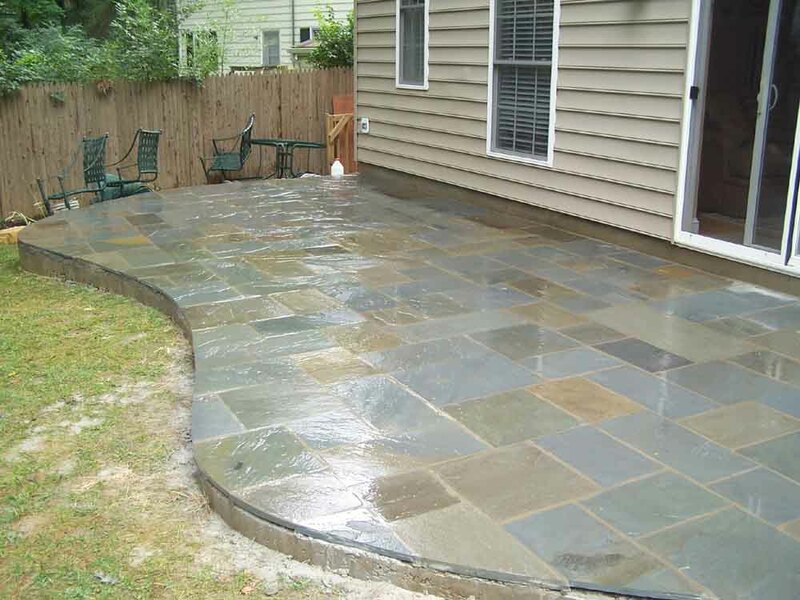 We’ll ensure that your final flagstone patio product is both visually appealing and up to code. Contact us today to begin your renovation project!